I make a lot of soups, they are perfect for me to take into work, reheat in the microwave and are healthier than whatever I would normally buy. Often I get questions from my work mates about the soups I bring in, “What’s in it?” and “Where did you buy it?”. But no soup has had quite the response that this one does. 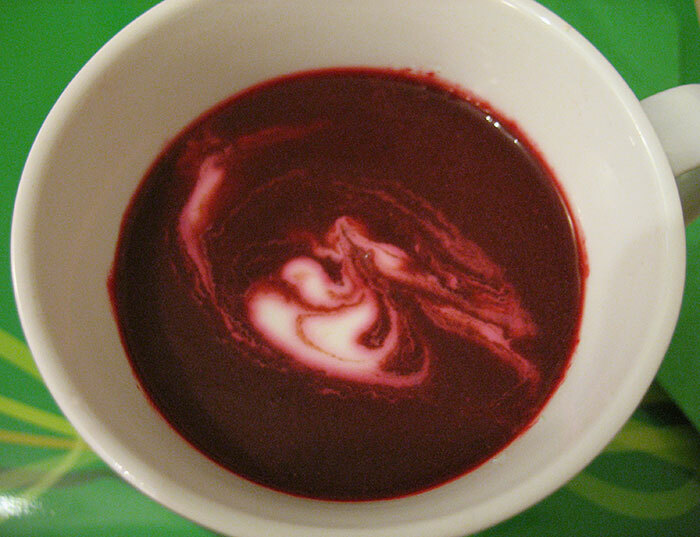 My usual soup repertoire of basics like Bacon, Tomato and Kale Soup and Carrot and Coriander Soup smell and taste wonderful but in no way elicit the same eye popping response of this purple Sweet Beet Soup. I’d love to say that all the questions were positive! But I am afraid most were along the lines of “What is that?”. I definitely got a few raised eyebrows, “Beetroot in a soup? How did you come up with that?”. Well of course I didn’t come up with it – someone else did. When I make a soup it’s with what vegetables I have lying around, and often with those that have seen better days. This week I had six purple beetroot sitting in my cupboard looking a bit wrinkled, when I came across this recipe for Golden Beet and Sweet Potato Soup. 1/4 teaspoon nutmeg (I reduced this, because I find nutmeg a really overpowering taste). 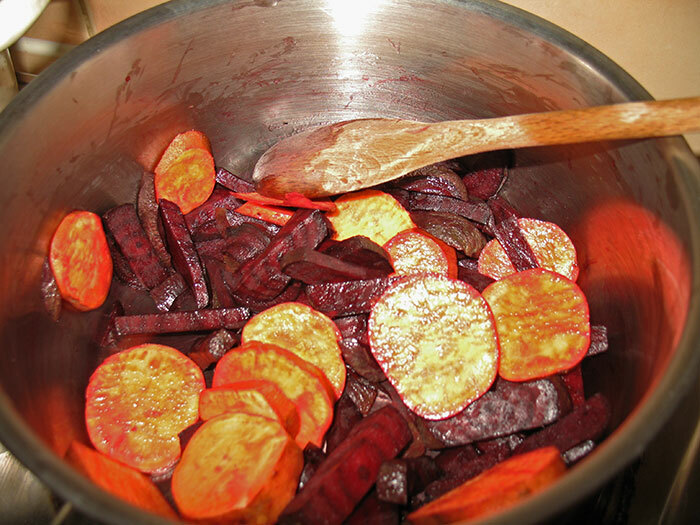 Add the chopped beetroots and sweet potatoes to a pan with the olive oil under a moderate heat for around 10 minutes. Then add the cranberry juice and simmer for another 10 minutes, the vegetables should be beginning to caramelise and soften. Add the spices and leave for a further couple of minutes before adding the coconut milk and the water. Simmer for 5 minutes (I left mine for closer to 10) before blending. Serve. As some of you who read my blog regularly know I am not a fan of sweetness in my savoury dishes, and I have to say while pot of purple was bubbling away on the hob I had my worries. Thankfully this soup is earthy and light, with a hint of sweetness, that just works. I served mine with some plain natural yoghurt to add a bit of tang. Liked this post? To see all my future posts you might want to subscribe to my RSS feed.